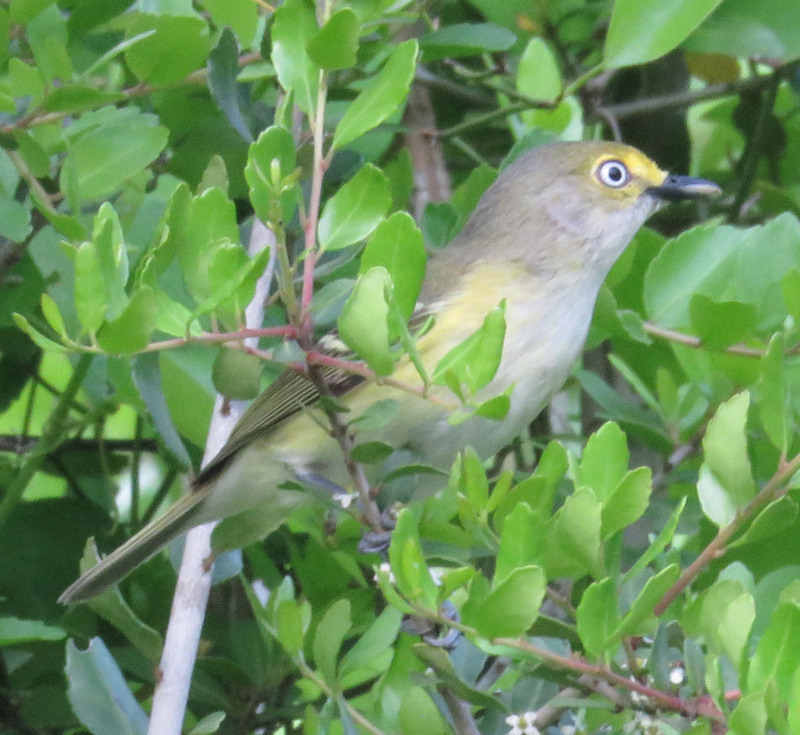 In my quest to document all the birds that visit our farm, I was happy that this week I was finally able to photograph a White-eyed Vireo here. I hear them all the time – their call is very memorable — “Quick! Get me a beer, chick!” John L. Tveten in The Birds of Texas says that vireos “sing incessantly through the day, even at noon when most other birds lapse into quiet lethargy,” and that is certainly true of the ones around here. They seem to stay at favorite spots in the brush, calling to each other all day. But I have never managed to get a glimpse of one until now. It seems like those white eyes would practically glow in the shadows. When they are immature, their eyes are dark, which makes me wonder if some of my unclassifiable “mystery” pictures were of young vireos. It was singing while it scoped me out. Maybe it was calling for reinforcements. 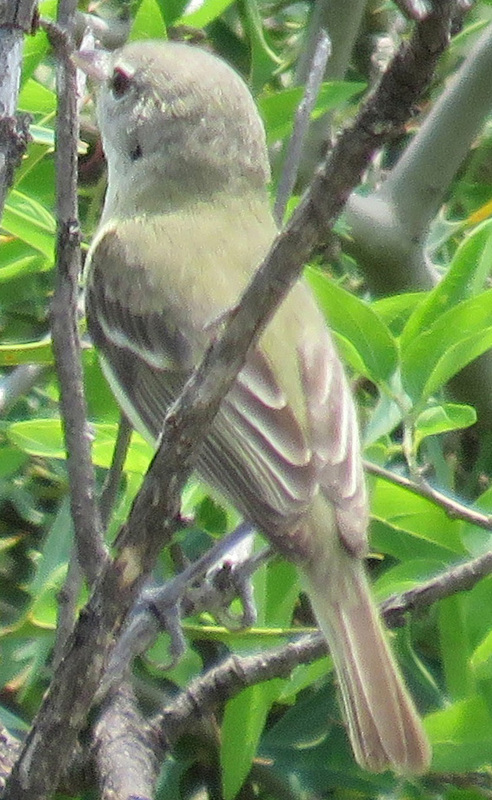 Vireos are a lot like warblers or flycatchers, in my opinion — very small birds that can have very similar appearances. But their activity patterns help to distinguish their families — flycatchers usually perch in one place, then fly out in a loop to catch a bug, and warblers flit constantly. 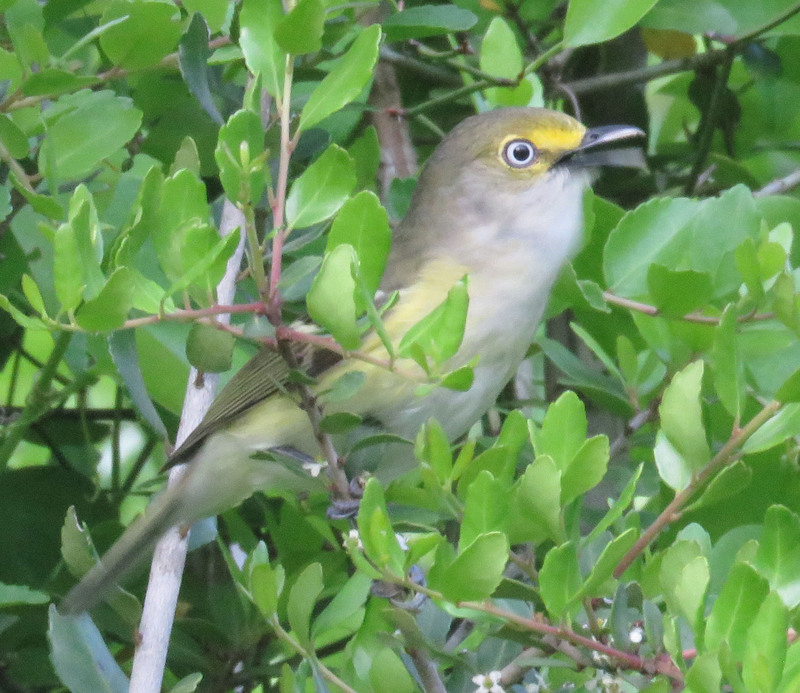 Vireos are slower and more methodical in the way they harvest insects. 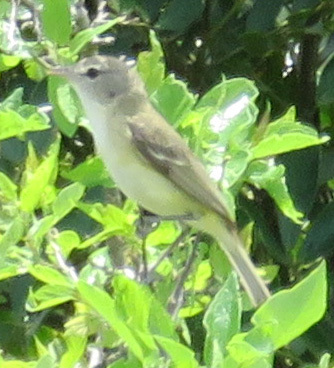 Out in the Hill Country, about six hours to our west, I got pictures of another vireo, a Bell’s Vireo, which boldly came out to see me as I hiked a trail at Kickapoo Cavern State Park. It is more nondescript than the White-eyed, but perhaps a little bolder. “Vireo” comes from Latin vivere, which means “to be green,” but these are subtle shades. Two hundred ninety-six species have been seen in our county; now I only have 199 to go! I hope I can get at least spot 100 here on our farm. Nice one Gwen! I’m sure you will soon get that 100. I like beer and will listen for their call. The maps show they should be in our area. No doubt. I know better.